Summary: If a proof contains a large amount of comments, reviewers may want to use the filter feature to quickly find specific comments. Available for: All users that have been invited into the proof and approval process. Each user is able to set their own filters. Where is the feature setup? The filter feature is located above the comments box inside the Proof Viewer. 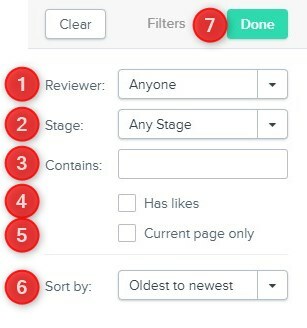 Stage - this option will filter all comments within a specified stage. Contains - with this filter you can type a word or any string of words to identify all comments/replies that contain the defined search criteria. Sort by - there are a number of options to choose from: Oldest to newest, Newest to oldest, Page Asc, Page Dsc, Creator A-Z, Creator Z-A. Done - by clicking "Done" this will apply the selected filter.